Six North Texas Soccer teams competed in the 2018 US Youth Soccer National Championships, which was be held July 24-29 at Toyota Soccer Center in Frisco, Texas. 13-Under Girls Liverpool 05 Elite, 14-Under Girls FC Dallas 04 Blue, 15-Under Girls Liverpool 03 Elite and 16-Under Girls Sparta FC 02 Elite all earned their respective spots in the National Championships by claiming US Youth Soccer Southern Regional Championships titles last month, while defending National Champions Solar 02 Stricker reserved the right to defend its national title by winning the 2017-18 US Youth Soccer National League White title in December. 2018 North Texas Soccer State Cup finalists in the 19-Under Girls age group, Invictus SC 99 rounds out the field of North Texas teams . Group play took place July 24-26, while semifinals in the 14-18 Under age groups and finals in the 13-Under and 19-Under age groups occurred July 28. The remaining champions were crowned July 29. Liverpool ran through group stage at the Southern Regional Championships – compiling a 3-0 record while scoring 12 goals and conceding none. After securing wins over Lonestar 05 Red (TX-S) and Dallas Texans 06 South (TX-N) in the quarterfinals and semifinals respectively, Liverpool defeated SSA Chelsea 05 Elite (GA) 2-1 in the finals. Liverpool will take on East Region Champs Pipeline SC Pre-Academy (MD), Far West Champions San Diego Surf Academy (CA-S) and Midwest Champions KHA 05 Red (KY) at the National Championships. 2018 State Cup Champions FC Dallas won its group at the Southern Regional Championships with a 2-0-1 record before securing a 5-1 win over IFC 04 Red (MS) in the quarterfinals. After defeating fellow North Texas side DFeeters 04 Voutier (TX-N) via kicks from the marks in the semifinals, FC Dallas won the Southern Regional title in extra time against Sunrise Sting 2004 Black (FL) 2-1. FC Dallas will join Far West Champions Arsenal FC (CA-S), National League Red Champions Nationals Union 04 Black (MI) and National League Blue Runner-up Michigan Jaguars 04 Green (MI) in Group B at the National Championships. Liverpool 03 Elite advanced out of Southern Regional Championships group play with a 2-1 record before earning a 2-1 win against Sunrise Sting 03 Black (FL) in the quarterfinals. Liverpool would then earn two-goal wins in the semifinals and finals against Murfreesboro FC 03 Storm (TN) and Lady Lobos Rush Premier (TN) respectively to claim the regional title. 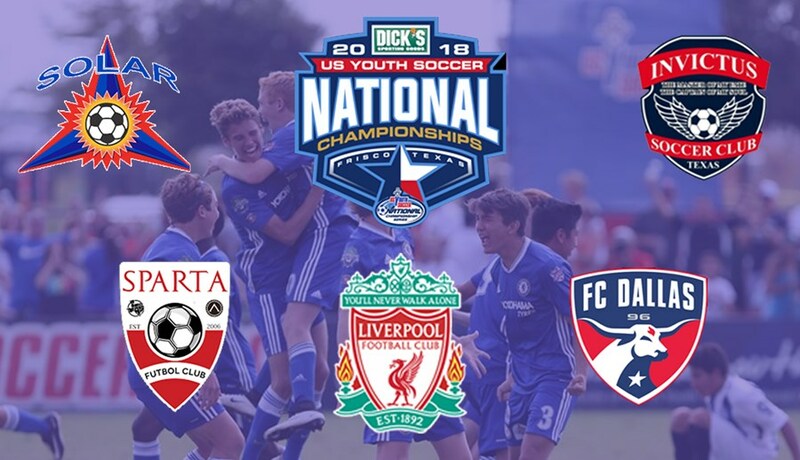 Liverpool will face defending National Champions LVPSA 03 Red (NV), Midwest Champions Cleveland FC 03 (OH-N) and National League Blue Runner-up IFC 03 GPS (OR) in Group A at the National Championships. Solar 02 Stricker returns to defend its National Championship title after going 5-1 in the National League White Division. Of the seven teams joining Solar at the National Championships, Solar owns wins over four in the past 12 months, including two wins against 2017 National Championships finalists and fellow Group B member Tuzos Academy 02 (AZ). Solar will look to avenge its only National League lost on the first day of the National Championships when it takes on Club Ohio Green (OH-S). There was no shortage of goals for Sparta FC 02 Elite at the Southern Regional Championships as the North Texas side scored 11 goals in three group play games before finding the back of the net nine times in three knockout games. Joining Sparta in Group B will be National League Black Champion La Roca FD 02 (UT), National League White Champions Legends FC 02 Academy (CA-S) and Midwest Champion North Shore United 02 Blue (WI). Invictus SC will compete against Far West Champion Utah FC 99 Black (UT), South Champion AFC Lightning 99 Elite (GA) and Midwest Champion NSA Shock (IL).